Composed by J. Andres Ballesteros. 21st Century, Contemporary Classical, Modern, Neo-Classical, Patriotic. Score, Set of Parts. 59 pages. Published by J. Andres Ballesteros (S0.146991). 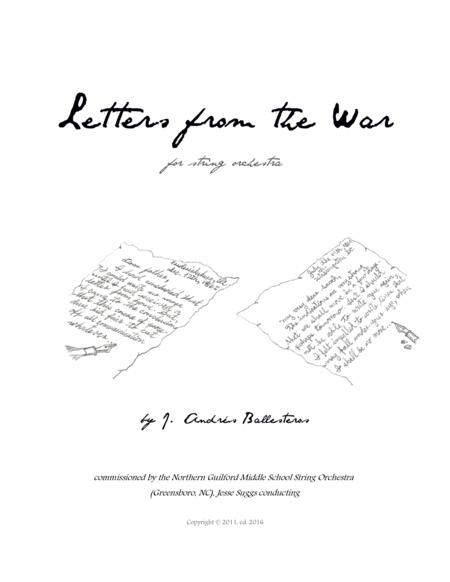 Letters from the War (2011) was commissioned by Jesse Suggs and the Northern Guilford Middle School Orchestra in the spring of 2010 and was written in commemoration of the 150th anniversary of the beginning of the American Civil War. The inspiration for the piece is drawn from a number of letters written by soldiers during the war. Some familiar tunes from that era are quoted throughout in keeping with the theme, and in the final movement, earlier parts of the piece are also quoted. 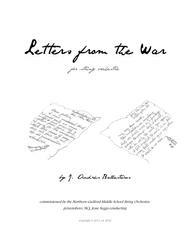 Together these letters and the music depict the narrative of the war, from a building march and a mournful ballad to a joyous celebration and a triumphant finale. This piece is a 3-movement concert piece appropriate for advanced middle school or intermediate high school orchestras. The piece includes brief solos for viola and violin in the second movement. Beginning intermediate level; appropriate for middle school or high school orchestras. ~8'30"